Your family does a lot for you: helping with homework, cooking your meals, and taking you to fun places. Why not give them a treat on Valentine's Day? A relaxing breakfast with a few special touches is a great way to show how much you love them. Use sturdy construction paper as your background. Gather some glitter glue, paper doilies (available at many grocery stores), different colors of construction paper, tissue paper or Valentine's Day napkins, and paint pens, crayons, or markers. Cut out hearts and overlap them a bit to make a more interesting design. Add pictures of yourselves and anything else flat you can think of that might be fun, and, of course, write a loving message. When you're finished, cover both sides with a clear, sticky sheet (available at most craft stores) and trim the edges. There's not much choice for fresh flowers in February. They fade so quickly and can be expensive. Instead of cut flowers, choose 1 or 2 dried or fabric flower bunches from the crafts department, and wrap the stems with fabric tape for security. Then, glue a scrap of lace or other pretty fabric over the tape for a little something extra to go on the breakfast tray. If there's no time for a sit-down breakfast, consider creating this frothy and healthy fruit shake. Just remember to remove the blender bowl from the base and soak it so you don't leave a mess for later! Place bananas, milk, honey and vanilla in a blender. Cover. Blend until smooth and frothy. Serve immediately. From BigOven. Little sisters and brothers can do simple tasks, such as adding and stirring ingredients. Always be careful with heat, sharp knives, and electricity, and check with a grown up before starting any kitchen task. Click here to learn about kitchen safety rules. The American Girls series introduces readers to young ladies from America's past. Cook with Kirsten, a pioneer girl from a Swedish family. Addy's family has escaped slavery by way of the Underground Railroad. Her family has kept its delicious traditions through difficult times. Felicity lives through the exciting times of the American Revolution at her home in Williamsburg. Josefina, living in New Mexico in 1824, tries to help run the household after her mother dies. Other girls to meet include Molly, a girl living on the Home Front in World War II, Samantha, an 1890s pampered New York beauty, and Kit, a young lady dealing with changed circumstances during the Great Depression. Fun and wonderful food! Breakfast treats include Wake-You-Up Apple-Cinnamon Muffins, Yummy Wake-Up Smoothies, Mile-High Blueberry Muffins, Gooey Cinnamon Buns, Buttery Maple-Corn Muffins, Kicked-Up Scrambled Eggs, Cinnamon Toast of Love, and Emeril's Favorite French Toast. Provides step-by-step instructions for a variety of recipes, arranged in such categories as "Breakfast Specials," "Soups, Sandwiches & Salads for Lunch or Supper," and "Desserts and a Few Baked Things." A fun how-to for kids from the author of vegetarian classic, The Moosewood Cookbook. 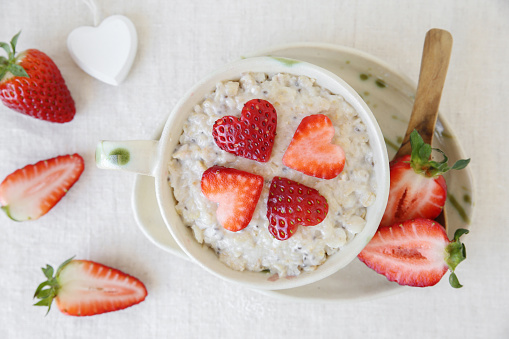 Why not include a pretty Valentine craft on your breakfast tray? This book has recipes for scones, truffles, and tea time treats which may also be good choices for a light breakfast. Recipes and crafts to help make Valentine's Day special. Twenty more recipes that are healthy and fun to make as well as delicious! Easy recipes for drinks, meals, and sweets that toddlers can help make. Terrific and easy recipes that are sure to liven up Mom's and Dad's breakfast bagels. Dependably delightful and super easy. This is one of the first things the famous chef made when he was a little boy. Fresh-squeezed orange juice adds an extra bit of "Bam!" Orange zest is grated orange peel. You can find it at the grocery store with the spices or grate your own. Rules of the road for kids and their caregivers. Has a list of age-appropriate kitchen skills for kids to try. A sweet take on the standard flap jacks. Fruit and low-fat cheese takes on the tortilla. This breakfast classic packs a lot of protein. There are lots of good recipes for kids at this website.